Hello gamers! Are you ready for August’s PS Plus lineup? First up, we have Mafia III. Play as Lincoln Clay, a Vietnam vet who comes back home after years of combat. When his surrogate family is wiped out by the Italian Mafia, Lincoln builds a new family and blazes a path of military-grade revenge through the Mafioso responsible. Next we have the 4v1 horror game Dead by Daylight. One player takes on the role of the savage Killer, and the other four players play as Survivors, trying to escape the Killer and avoid being caught, tortured and killed. Additionally, we’re offering a bonus PlayStation VR game* for PS Plus members this month! From August 7 through October 2, PS Plus members can download Here They Lie free for their PS VR system. Experience the game where death is not a checkpoint. Explore a nightmarish city inhabited by strange, malevolent creatures in this first-person horror game, where unsettling encounters and environments come to life. Now, if that wasn’t enough, you can also get Knowledge is Power as part of your PS Plus membership from August 7 through November 6. Outsmart your opponents with a massive variety of trivia questions and tactical challenges. Be sure to have a compatible mobile device and companion app and you’ll be all ready to play! *PlayStation 4 system, PlayStation VR, and PlayStation Camera are required to experience VR functionality. If I didn’t already own Mafia 3 i would say this is a great PS Plus month, BUT! Go to te ps store scroll dow to ps plus and there they are. When is it free? Bc it doesn’t say on my acct. I’ve been a PS+ subscriber since the beginning and it’s always been nice to have games offered for “free” that you don’t already own. Also it’s kind of a slight bummer when you already own a game that’s being offered for free, but oh well, dems da brakes! Nothing to get all huffin ‘n puffin about. It truly has become a regular thing here in the comments to see half of the folks complaining about their dissatisfaction with the games offered not being what they want and the other half trying to make these people aware that they’re big crybabies and just don’t get it. But every now and then you’ll see comments about the actual games and what they think about them positive or otherwise. You know, productive comments, like the one about Here They Lie being a VR game that can be played non-VR so everyone can check it out. Super wicked tripped out game btw. I already own it but I’m not gonna sit here and be sad that it’s free now. I think its great that more people can play it now. Though i highly recommend experiencing it in VR! I love your comment. You and the people with productive comments are the few good ones in this comments. But wait, I boughtDead By Daylight two days ago! Just wondering if all the people complaining about there $2 to $2.5 dollar games complain about their toy they get in their $2.5-$3 dollar happy meal. Reminds me of seeing a little kid throw a temper tantrum because they didn’t get the toy they wanted. People forget they are not the only person on PSN. People like different games they need free games also. Sometimes you just have to be happy for them. ALL games that I’ve wanted and considered getting… well done, guys. Isn’t mafia 3 a demo not a free game.. it says demo not free?? 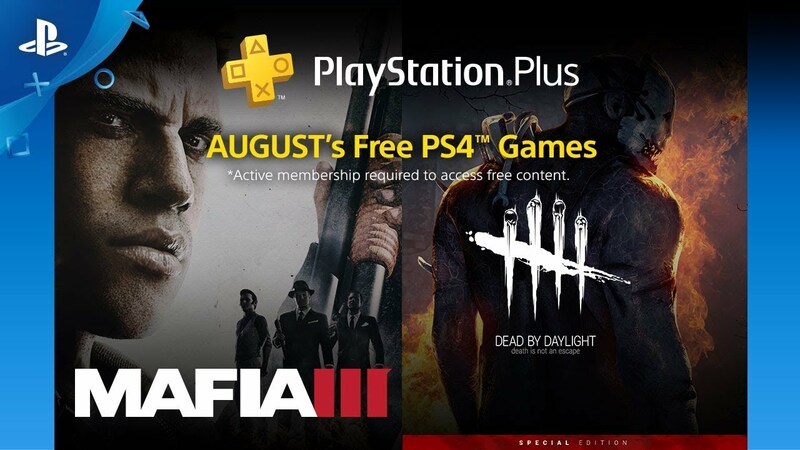 Great month…Dead by Daylight screams free game no way to get it in any other form than free and Bound by Flame is perfect for the lineup too,Draw Slasher is another that as free is at it’s best “price”.Also very nice to get Here They Lie and Knowledge is Power as bonus offerings.This month is a blast…a lot of perfect choices for free games which doesn’t happen often,doubt I’ll ever touch Dead by Daylight though lol. Mafia 3 is a helluva great game for the lineup. You guys wonder why PSN+ subscriptions are dropping despite strong hardware sales? Fewer and fewer people care about trash fee-tp-pay multiplayer games and the free games are consistently terrible. If you’re gonna give old games at least pick good ones not the 5’s and 6’s you guys usually dish out. Frankly, I don’t think I’m going to renew mine when it expires, don’t much care about multiplayer and there’s maybe 2 or 3 games a year that you guys give that I actually want. When do those games come out this month? (Everything except Mafia III) I’ve beaten that already. You pay $60 a year and get a few hundred dollars worth of free games plus a ton of discounts on games, movies, and dlc content so why complain about what the games are? Its awesome having a stash of games in your library to play. You buy new release games all the time and play them for a few months and most likely trade them in on something else or if you bought it digital then you just uninstall it to make room for some other game so there is $60 just for that one game that you will never get $60 back out of or you pay the $60 subscription for the year and get a couple free games every month usually they give 3 good games thats 36 free games a year for the cost of 1 new release and thats not counting the other deals you get on movies and other content. Switch to X-Box if your life is just so terrible as a PS Plus member. I keep checking the ps plus member free games for this month and death by daylight still costs $30. I was excited to see that it would be free for members this month but I checked on my PlayStation and it still is $30. Am I doing something wrong or is it just not up yet for free? It says August 7th… you know, the First Tuesday of the month. That is when ps+ games release. The first Tuesday. PlayStation you dropped the ball on this one. You didn’t add mafia III to the ps plus free download list. You added mafia II cause when I type in your supposedly “game” you to had pay for that one. Was looking forward to actually playing mafia III. Hope someone see this and corrects the problem cause I would love to play this game. Thank you guys in advance. Hi! Thx for games! Can i ask you a question? WHERE ARE MY GAMES?! sooo… i think now it’s 7th? Where? Not gonna lie was wondering the same thing. I already got a physical copy of dead by daylight I just want to get Mafia 3 and here they lie. What time will they be releasing? Great selection this month Sony thank you. Now will you please include at least one JRPG every two or three months for PS+. That would be excellent. I’d just like to say well done Sony!! The kids are on school summer holiday this month so your offering 3 games that are all rated 18+ . I’m sure your future gaming generation is well impressed! I have PS plus for 4 kids 10 and under. I find it disappointing that all the games are rated T and M.
I really enjoyed Mafia II but people said Mafia III is way too repetitive and not worth it. I’ve been playing for only about 16 hours and I am enjoying it. Yes, most of the missions include going to a place and killing people or destroying some contraband but I don’t mind it and the story has me invested. But this is coming from someone who likes a good grind sometimes. For example I did all the repetitive side missions in Saints Row the Third to 100% districts and I think those side missions are even more repetitive.